A core group was formed and an inaugural meeting was held in March, 1986. 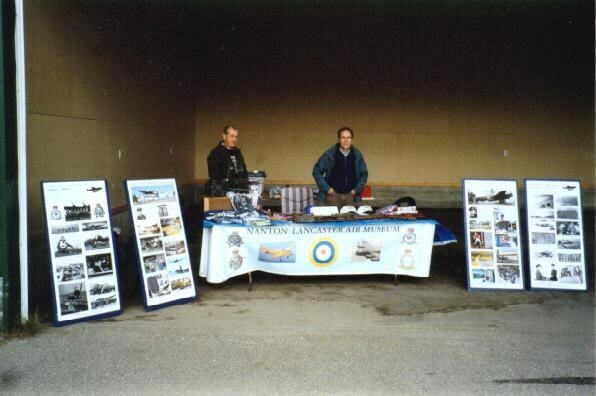 Various committees were formed and by May some Lancaster related artifacts were on display and Lancaster T-shirts and caps were for sale in the Tourist Information Booth next to the aircraft. The founding members had also made the decision that the best way to, “take care of the Bomber” was to have it become the centrepiece of an air museum. 1987 saw the first issue of the Society’s newsletter which was sent to its five hundred members, a delegation from Nanton visited the Canadian Warplane Heritage Museum in Hamilton which was restoring a Lancaster to airworthy condition, and in May the first “Open Bomber Day” was held. This featured public tours through the Lancaster and was most successful with long lines forming at the ladder leading to the cockpit. This was the first concrete indication that the public was interested in the Lancaster and provided momentum to the museum project. 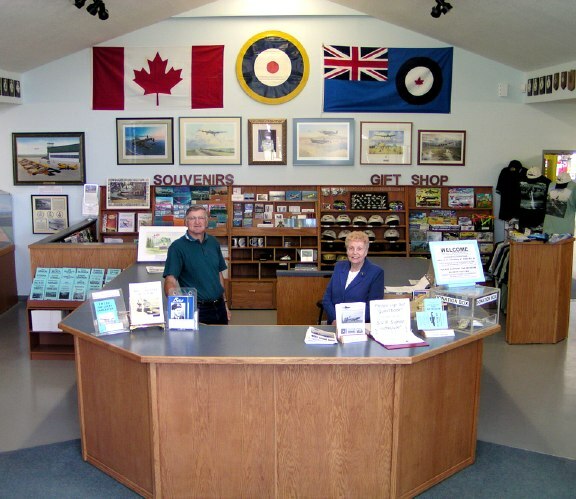 Guided tours of the Lancaster during the months of July and August began in 1988 which also saw the opening of a Society Restoration Shop and a Society float in the Calgary Stampede Parade. During these early years, Society members made numerous “field trips” to locations in southern Alberta where Canadian Lancasters had been dispersed after the war. In the mid-fifties a company known as Found Brothers determined that money could be made by purchasing Lancasters from the farmers who had acquired them in the late 1940’s, melting down the aluminum, and selling other components back to the RCAF which now required spares for their Lancaster reconnaissance aircraft. Numerous and varied parts which included tires, undercarriage struts, turrets parts, and even crew door ladders which were not wanted by Found Brothers were left behind on the farms. Many truckloads of Lancaster parts and display material were acquired by the Society from the cooperative farmers. As well, the Society began to collect the remains of twin-engined Ansons as the historical significance of the BCATP began to be appreciated. 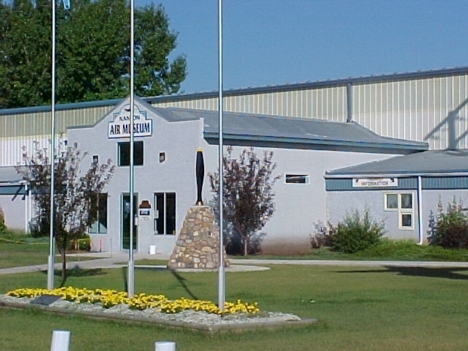 A building was constructed in 1991, expanded in 1998, and again in 2002 to house a growing collection of aircraft and related displays. The facility now includes almost 20,000 square feet of hangar area and 3000 square feet used for the display of smaller artifacts, aviation art, and related interpretive information. A library/meeting room, sizeable restoration shop, parts storage area, and office complete the museum. Construction was financed primarily through private and corporate donations with less that 4% of construction costs coming from taxpayers. Lottery Fund profits obtained through the provincial government provided an additional 22% of the buildings $1,000,000 value. The acquisition of aircraft and other artifacts, primarily through private donations, has provided the Society with an impressive collection of displays. Bomber Command aircraft are represented by the Lancaster and a Bolingbroke which is being restored as a Blenheim IV bomber. BCATP aircraft such as the Fleet Fawn, Tiger Moth, Cornell, Anson, Yale, Harvard, and Expeditor provide our visitors with an excellent understanding of the training effort. On outside display, a T-33 and CF-100 serve as “Gate Guardians.” The Society attempts to connect people to the artifacts as much as possible. Our Lancaster has been dedicated to S/L Ian Bazalgette VC, the only Albertan to be awarded the Victoria Cross during WW II. Barry Davidson, a southern Alberta pilot who spent almost five years as a POW and was very involved in “The Great Escape,” has his aircraft’s markings on our restored Blenheim. Our restored Blenheim cockpit section honours Albert Prince. Sgt. (Pilot) Prince was our country’s first casualty of the war and the first of the ten thousand Canadians to lose their lives serving with Bomber Command. Special displays, such as one honouring members of our local community who served, enhance the two basic themes of the museum. Despite all of the aircraft, artifacts, vehicles, aviation art, videos, and displays at the museum, Lancaster FM-159 remains the centrepiece as was originally envisioned by Society members in 1986. Its future now secure, the Lanc invariably impresses and sometimes overwhelms visitors with its size and stature. The displays and interpretive information that the museum has made available assist visitors in understanding this legendary aircraft and the history it represents. We strive to make our visitors welcome and to appreciate the “people” involved in the history we present, not just the aircraft, vehicles, and artifacts. We do not honour or glorify war here. Rather we remember and try to understand the massive and important efforts and sacrifices were made by a previous generation to secure the peace and freedom we enjoy today. But the Nanton Lancaster Society is determined to do more. Our restoration shop continues to work on various components of the Lancaster and other aircraft. New artifacts are constantly being acquired and new displays prepared, our newsletter is published twice each year to keep our membership up to date as to museum progress. The Society’s travelling display regularly attends airshows and other events to promote the museum and take our message to other centres. The Nanton Lancaster Society continues to operate as an all-volunteer, community supported organization. It is our hope that the museum will continue to develop and improve its ability to help future generations appreciate and understand our Country’s contribution to the massive efforts that were Bomber Command and the BCATP.